In his series of photographs from 1916 Jean Cocteau, recorded one of the afternoons spent in the company of very distinctive bohemian figures of Paris’ Montparnasse district including Pablo Picasso, Amedeo Modigliani, Max Jacob, Eric Satie, Moise Kisling and others. These photographs, shot intuitively during a single August day barely 100 kilometers behind the front lines of the World War I, became a valuable historical document of the city where many progressively minded figures lived and worked. Cocteau’s photo series aims to recount a story beyond the goal of documentation, it could thus be viewed also as an important contribution to aesthetics of reproducible media. Prior to the exhibition at Photon, the series had only been shown in Europe on three other occasions. The other significant fact of the exhibition at Photon is that it also addresses the 100th anniversary of this event. The series of photographs was discovered by Billy Klüver, the founder of E.A.T. Archive, New Jersey, while the lender of presented materials is Klüver / Martin Collection. Cocteau’s photographs are confronted by the works of his contemporary, Slovenian artist and photographer Veno Pilon who, after serving in Austrian-Hungary army during World War I, settled in Paris in the late 1920s. Pilon was one of the ambitious newcomers to Paris and he quickly became an integral part of the art scene. Initially a painter, he soon switched to photography and practiced both, simultaneously. 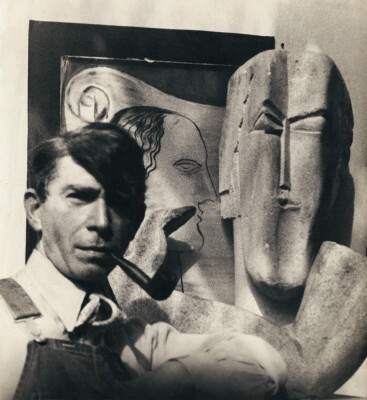 In 1930’s he created a series of portraits of artists such as Giorgio De Chirico, Alexander Rodchenko, Ossip Zadkine and Massimo Campigli. He was particularly known for photographing artists in Montparnasse, usually in their studio environment. Bohemians from Montparnasse brings a selection of photographic works from the Veno Pilon Gallery from Ajdovščina, also a partner of the project.